Modern manufacturing techniques continue to open doors into creative options for many of our modern cooking appliances. One arena where you see this show up is in outdoor grill designs. 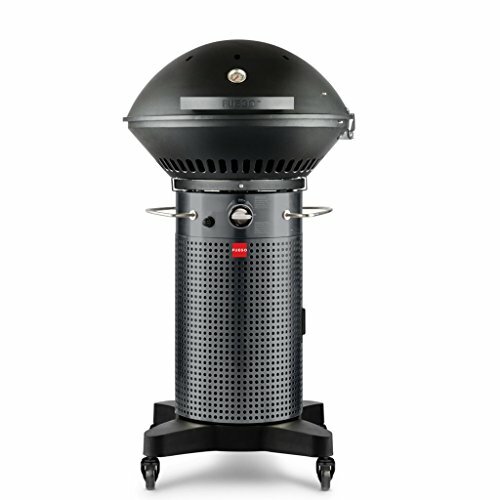 The Fuego F24C blends ultra-modern looks with a quality, small footprint gas grill. This is technically and enhanced or redesign of the previous model, which is a statement on Fuego’s willingness to accept feedback from their loyal customers. The concentric propane burners produce 26,500 BTU’s of heat. The domed lid was specifically designed to evenly distribute the heat over the 415 square inch primary grate and the 110 square inch warming rack. Fuego claims that the F24C is capable of dual heating zones ranging between 500 and 250 degrees Fahrenheit. The preheating time to the maximum temperature has been clocked at 5-minutes. The hinged lid was specifically designed to open at a 45-degree angle away from the main grate. This keeps you from having to reach directly over the open flame. 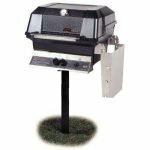 The pedestal body is designed to securely hold a 25-pound propane tank. It also features a “Perfect Clasp” door closing system to lock the tank in place. With the redesign of the Fuego F24C, extra emphasis was put on upgrading the quality of some of the key components. The cast iron grill grates with their protective non-stick coating are a very nice touch. The decreased 24-inch by 24-inch footprint with non-marking feet is more compact, yet sturdier than the previous iteration. The domed lid is specifically designed to help redistribute the heat from the concentric burners. The 45-degree hinge that spares you from burning your wrist is also a nice little touch. The jury is still out on the grill’s overall looks and resemblance to the robot in the movie Rocky IV. The assembly process is relatively easy considering its unique looks. Just take your time tightening all the fasteners to make sure it is sturdy from the feet, through the pedestal, to the top. All that being said, you should be able to fully assemble the Fuego F24C in a little over half an hour. This grill was designed to only work with propane. There is no natural gas conversion kit for it. When your first look at the Fuego F24C, the “Eye-Test” tempts you to think that it doesn’t have a lot of capacity. Sure, this isn’t the kind of grill you are going to improvise as a smoker. The claim that it is capable of dual heat zones ranging between 500 to 250-degrees. While I’m sure there is someone out there wearing a white lab coat, who can prove this on some technical level, it’s not something you should bank on doing yourself on a Tuesday night. This same guy in a white lab coat has also tested the capacity of the primary grate. They claim it can hold 20 quarter-pound hamburger patties that are 4.5-inches in diameter, or up to three small broiler-fryer beer can chickens. Now, before you take out your slide-rule and a digital scale, the reality is you aren’t going to get these same numbers. If you love making beer can chicken, you are going to have to do it with the lid open. If you want a more robust sized hamburger patty, then you can probably eyeball 10 to 12 onto the primary grill grate. The warming rack can sometimes get in your way, depending on what you are trying to grill. Fortunately, it’s pretty easy to remove while the grill is still cool. 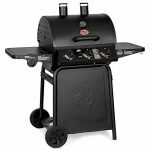 The primary grill grate offers 415 square inches of cooking space. The warming rack measures in with another 110 square inches. This gives you a grand total of 525 square inches. The 45-degree hinged, and domed lid is a nice touch. It reduces your risk of burning your arm when you open and close the grill. At the same time, the internal contour works with the concentric propane elements to provide more consistent heat. The “Perfect Clasp” door closing system helps secure the propane tank in place. It also helps the pedestal base to remain sturdy. The Fuego F24C redesign included making some minor upgrades in it’s easy to clean. 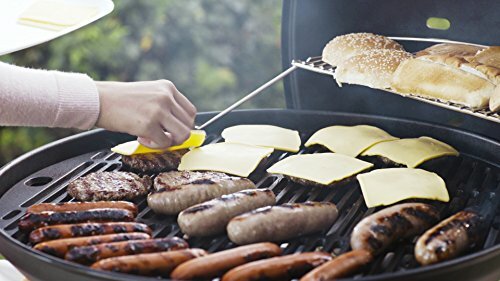 The grill grates have a special non-stick coating which makes it easy to scrape down with a nylon bristled grill brush. Every now and then you have to be a little meticulous to get the lower sides of the grill grate. This iteration of the F24C includes a large drip pan. All you need to do is pull it out when you’re done grilling. Pour it away in a disposable cup, and then wash or wipe it clean. 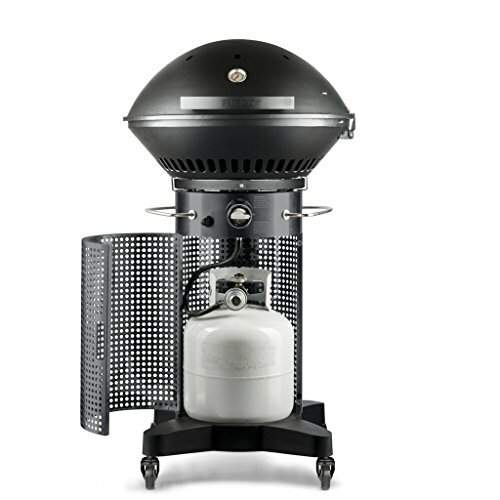 The grill grate and other components all come with a 1-year warranty. This is in the same neighborhood of other grills in this price range. Though some of the Fuego F24C’s competitors do offer a two or even three-year limited warranty. There are some online retailers who offer an affordable two or three-year protection plan. The Fuego F24C certainly has a visually interesting and unique look. There is also some innovation going on with this grill. The concentric burners and domed lid, with its 45-degree hinge helps circulate the heat. Still, this isn’t the grill you want to go to if you love making beer can chicken with the lid closed. Nor is it your best option for improvising as a smoker. The compact 24-inch footprint, with non-skid feet, and a sturdy pedestal base is also nice if space on your deck or patio is at a premium. With this version of the grill, Fuego also offers an accessory grill cover at a very affordable price.